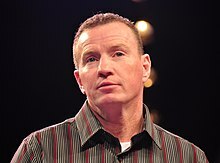 George Michael Ward Jr. (born October 4, 1965), often known by his nickname of "Irish" Micky Ward, is an American former professional boxer who competed from 1985 to 2003. He challenged once for the IBF light welterweight title in 1997, and held the WBU light welterweight title in 2000. Ward is widely known for his trilogy of fights with Arturo Gatti, two of which received Fight of the Year awards by The Ring magazine, as well as his relentless pressure fighting style. In the 2010 film The Fighter, based on his early career, Ward was portrayed by Mark Wahlberg. Ward was a three-time New England Golden Gloves champion boxer who turned pro in 1985, winning his first fourteen fights. However, his career leveled off, and after losing four consecutive fights in 1990/91, Ward took a hiatus from boxing. During Ward's time away from the sport, he used some of the funds from his day job on a road-paving crew to have surgery on his right hand, which had given him problems during several bouts. The surgery used some of the bone from Ward's pelvis to strengthen and fuse the bones in his hand. His half-brother, former boxer Dicky Eklund, who was struggling with drug addiction and had just been released from jail on charges including drug possession, convinced Ward to take up the sport again. Ward was successful in his return, winning his first nine fights, and won the WBU's Intercontinental Light Welterweight Title in a fight against Louis Veader. He defended the belt once, in a rematch against Veader. In a 1997 match that would come to typify the exceptional power of Ward's left hook to the body, he scored a 7th-round knockout against the then-undefeated Mexican Alfonso Sanchez in a fight that Ward, up to then, was clearly losing on points. Shortly before the punch, Larry Merchant said the fight should be stopped (which referee Mitch Halpern had threatened to do if Ward didn't "show [him] something"); afterwards Merchant called it one of the most extraordinary things he'd ever seen in boxing. Ward's left hook to the body later resulted in a first-round knockout of Steve Quinonez and, perhaps most famously, a nine-count knockdown of Arturo Gatti in the first fight of their legendary trilogy. Ward earned a 1997 IBF Light Welterweight Championship fight against champion Vince Phillips, but did not win the championship, as the fight was stopped in the third round due to cuts, and Phillips was awarded the bout via TKO. One year later, Ward again would come up short in a title fight, as he lost a 12-round decision against Zab Judah. In 2000, Ward traveled to London to take on the WBU Light Welterweight Champion, Shea Neary, and earned a TKO in the eighth round to win the WBU title. Ward, however, never defended the title, and split his next four fights. His ten-round decision victory over Emanuel Augustus (then known as Emanuel Burton) was voted The Ring magazine's 2001 Fight of the Year. On May 18, 2002, Ward faced the opponent with whom he became most identified, Arturo Gatti. The fight was a wild one, but a ninth round Ward knockdown of Gatti proved to be the difference, with Ward winning a majority decision. The fight was later named the 2002 Ring magazine fight of the year. Both fighters needed care in a trauma center after the match. The two agreed to an immediate rematch, and in November, Gatti was able to win the second wild fight. Ward was knocked down in the third round, but survived to finish the fight. Gatti paid tribute to Ward's tenacity after the fight, saying, "I used to wonder what would happen if I fought my twin. Now I know." They then agreed to a third straight fight, and again, the fight was back and forth. Gatti pounded Ward with punch after punch early on, but Ward fought back and managed a sixth round knockdown of Gatti. Before Gatti could get up, or the referee's count could hit ten, the bell sounded to end the round. Gatti was able to come back and win the fight via a unanimous decision. Again, both men needed a trip to the hospital, due to the injuries they suffered. The fight was named the 2003 Ring magazine fight of the year, the third straight for Ward. Ward was the first fighter to achieve this since Rocky Marciano and Carmen Basilio each did so in the 1950s. Ward made approximately $3 million in earnings for his trilogy with Gatti; the most lucrative fights of his career. Ward still lives in Lowell, where he is part owner of both a boxing gym as well as an outdoor hockey rink. Ward is married to Charlene Fleming, his longtime girlfriend, who is also a former athlete. He manages the boxing gym he owns and his half-brother and former trainer, Dicky Eklund, trains new boxers entering its academy. In his 2012 autobiography, Ward revealed that he had been sexually abused as a child by a friend of Dicky's, another boxer referred to only by his nickname, "Hammer". The abuse began when Ward was nine years old and continued for approximately three years, until he gained the confidence to confront his attacker. Ward would eventually face off against Hammer in one of his first amateur bouts, winning by unanimous decision. The story of Ward's comeback and rise to fame was made into a 2010 feature film, The Fighter, starring Mark Wahlberg (who was nominated for the Golden Globe for Best Actor) as Ward. Wahlberg confirmed to Spike TV that The Fighter 2 is in the works, which will focus on the legendary fight trilogy between Ward and Arturo Gatti. Philadelphia hip hop group Jedi Mind Tricks released two remixes to their single, Animal Rap from their third album Visions of Gandhi (2003), dubbed the "Micky Ward Mix" and "Arturo Gatti Mix". The album The Warrior's Code by Dropkick Murphys features Ward on the cover, and he is also the subject of the title song. A live recording of the song is heard in The Fighter. The game Fight Night Round 3 (2006) features Ward and Gatti on the cover (PS2 and Xbox versions only). 51 Loss 38–13 Arturo Gatti UD 10 Jun 7, 2003 Boardwalk Hall, Atlantic City, New Jersey, U.S.
50 Loss 38–12 Arturo Gatti UD 10 Nov 23, 2002 Boardwalk Hall, Atlantic City, New Jersey, U.S.
49 Win 38–11 Arturo Gatti MD 10 May 18, 2002 Mohegan Sun Arena, Montville, Connecticut, U.S.
47 Win 37–10 Emanuel Augustus UD 10 Jul 13, 2001 Casino Ballroom, Hampton Beach, New Hampshire, U.S.
46 Win 36–10 Steve Quinonez KO 1 (10), 3:03 May 18, 2001 Foxwoods Resort Casino, Ledyard, Connecticut, U.S.
45 Loss 35–10 Antonio Díaz UD 10 Aug 19, 2000 Foxwoods Resort Casino, Ledyard, Connecticut, U.S.
43 Win 34–9 Reggie Green TKO 10 (10), 2:40 Oct 1, 1999 Icenter, Salem, New Hampshire, U.S.
42 Win 33–9 Jermal Corbin RTD 5 (10), 3:00 Jul 16, 1999 Casino Ballroom, Hampton Beach, New Hampshire, U.S.
41 Win 32–9 Jose Luis Mendez TKO 3 (8) Mar 17, 1999 The Roxy, Boston, Massachusetts, U.S.
39 Win 30–9 Mark Fernandez KO 3 (8), 1:57 Apr 14, 1998 Foxwoods Resort Casino, Ledyard, Connecticut, U.S.
37 Win 30–7 Alfonso Sanchez KO 7 (10), 1:53 Apr 12, 1997 Thomas & Mack Center, Paradise, Nevada, U.S.
36 Win 29–7 Manny Castillo SD 10 Dec 6, 1996 Lawlor Events Center, Reno, Nevada, U.S.
33 Win 26–7 Alex Ortiz TKO 1 (6) Mar 15, 1996 Wonderland Greyhound Park, Revere, Massachusetts, U.S.
32 Win 25–7 Alberto Alicea TKO 3 (8) Jan 26, 1996 Wonderland Greyhound Park, Revere, Massachusetts, U.S.
31 Win 24–7 Edgardo Rosario TKO 1 (4) Dec 30, 1995 Wonderland Greyhound Park, Revere, Massachusetts, U.S.
30 Win 23–7 Genaro Andujar KO 3 (10) Sep 10, 1994 Memorial Auditorium, Lowell, Massachusetts, U.S.
29 Win 22–7 Luis Castillo TKO 5 (10) Jun 17, 1994 Sheraton Inn, Lowell, Massachusetts, U.S.
28 Loss 21–7 Ricky Meyers UD 10 Oct 15, 1991 Trump Plaza Hotel and Casino, Atlantic City, New Jersey, U.S.
27 Loss 21–6 Tony Martin UD 10 May 2, 1991 Etess Arena, Atlantic City, New Jersey, U.S.
24 Win 21–3 David Rivello SD 10 Feb 3, 1990 Hynes Convention Center, Boston, Massachusetts, U.S.
23 Win 20–3 Clarence Coleman TKO 5 (10), 2:50 May 23, 1989 Showboat, Atlantic City, New Jersey, U.S.
21 Win 19–2 Francisco Tomas da Cruz TKO 3 (10), 0:45 Dec 13, 1988 Resorts International, Atlantic City, New Jersey, U.S.
20 Loss 18–2 Mike Mungin UD 10 Sep 9, 1988 Resorts International, Atlantic City, New Jersey, U.S.
19 Win 18–1 Marvin Garris TKO 2 (10) Jul 9, 1988 Sands, Atlantic City, New Jersey, U.S.
18 Win 17–1 David Silva UD 10 May 19, 1988 Resorts International, Atlantic City, New Jersey, U.S.
17 Win 16–1 Joey Olivera UD 10 Feb 19, 1988 Bally's Las Vegas, Paradise, Nevada, U.S.
16 Win 15–1 Joey Ferrell TKO 1 (10), 2:36 Jan 15, 1988 Resorts International, Atlantic City, New Jersey, U.S.
15 Loss 14–1 Edwin Curet SD 10 Sep 25, 1987 Resorts International, Atlantic City, New Jersey, U.S.
14 Win 14–0 Derrick McGuire TKO 4 (8), 2:33 Aug 25, 1987 Bally's Park Place, Atlantic City, New Jersey, U.S.
13 Win 13–0 Kelly Koble TKO 4 (8), 3:00 Apr 6, 1987 Caesars Palace, Paradise, Nevada, U.S.
12 Win 12–0 Hilario Mercedes SD 8 Feb 24, 1987 Resorts International, Atlantic City, New Jersey, U.S.
11 Win 11–0 Carlos Brandi KO 2 (10), 2:55 Oct 24, 1986 Memorial Auditorium, Lowell, Massachusetts, U.S.
10 Win 10–0 John Rafuse UD 8 Aug 29, 1986 Memorial Auditorium, Lowell, Massachusetts, U.S.
9 Win 9–0 Rafael Terrero TKO 2 (6), 1:12 Jul 4, 1986 Resorts International, Atlantic City, New Jersey, U.S.
8 Win 8–0 Ken Willis PTS 6 Jun 15, 1986 Trump Plaza Hotel and Casino, Atlantic City, New Jersey, U.S.
7 Win 7–0 Luis Pizarro TKO 3 (6), 2:39 May 30, 1986 Harrah's at Trump Plaza, Atlantic City, New Jersey, U.S.
6 Win 6–0 Darrell Curtis TKO 5 (6), 2:05 Apr 18, 1986 Harrah's at Trump Plaza, Atlantic City, New Jersey, U.S.
5 Win 5–0 Jesus Carlos Velez KO 6 (6), 2:02 Feb 21, 1986 Harrah's at Trump Plaza, Atlantic City, New Jersey, U.S.
4 Win 4–0 Mike Peoples UD 4 Jan 24, 1986 Resorts International, Atlantic City, New Jersey, U.S.
3 Win 3–0 Chris Bajor TKO 3 (4), 1:17 Jan 10, 1986 Resorts International, Atlantic City, New Jersey, U.S.
2 Win 2–0 Greg Young TKO 4 (4), 1:45 Aug 27, 1985 Memorial Auditorium, Lowell, Massachusetts, U.S.
1 Win 1–0 David Morin TKO 1 (4), 1:20 Jun 13, 1985 Roll-On-America Skating Rink, Lawrence, Massachusetts, U.S.
^ sweetfights. "Micky Ward vs Alfonso Sanchez Amazing Knock Out Body Punching" – via YouTube. ^ Boehm, Mike. "Arturo Gatti: Remembering Ultimate Blood and Guts Warrior", ProBoxing-Fans.com, n.d.
^ Lem Satterfield, provided by (2011-01-07). "Surprised Micky Ward's 'Honesty And Integrity' Recognized". Sfgate.com. Retrieved 2011-01-28. ^ "The Fighter" – via www.imdb.com. ^ Ward, Micky (2012). A Warrior's Heart. Berkley Books. pp. 47–55. ISBN 9780425247556. ^ "The Warrior's Code. Dropkick Murphys". Dropkickmurphys.com. Retrieved 2011-01-28. ^ "Epitaph Records. Dropkick Murphys". Epitaph.com. Archived from the original on 2012-09-28. Retrieved 2011-01-28. Cooley, Will. "'Vanilla Thrillas': Modern Boxing and White-Ethnic Masculinity," Journal of Sport and Social Issues 34:4 (November, 2010), 418–437.